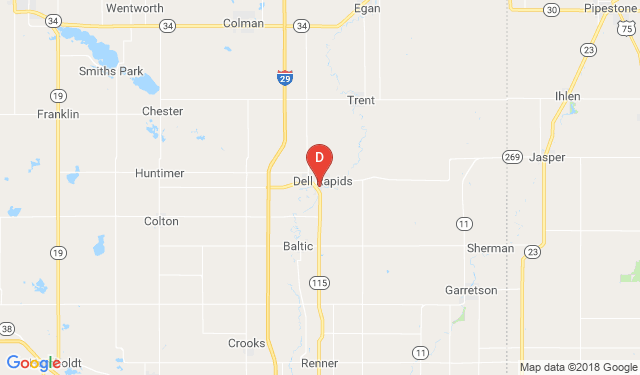 Dells Auto is just north of Sioux Falls, South Dakota in Dell Rapids. Because our dealership is so conveniently located, we have customers that come near and far to buy their cars, trucks, vans and SUVs from us. We are just a short drive from Chester, Madison, Garretson, Hartford, Brandon, Tea, Harrisburg, Flandreau, Lennox, Humbolt, Colman, Howard and Brookings, South Dakota. Luverne, Edgerton, Pipestone, Adrian, Slayton, Worthington, Minnesota as well as Larchwood, Inwood, Rock Rapids and Rock Valley, Iowa. For step by step instructions, enter your starting location and click "Get Directions."